AS A FOOTBALLER Jake Kedzlie led from the front and as a mate "he was a role model to many". That's according to his schoolmates who yesterday spoke of their grief. 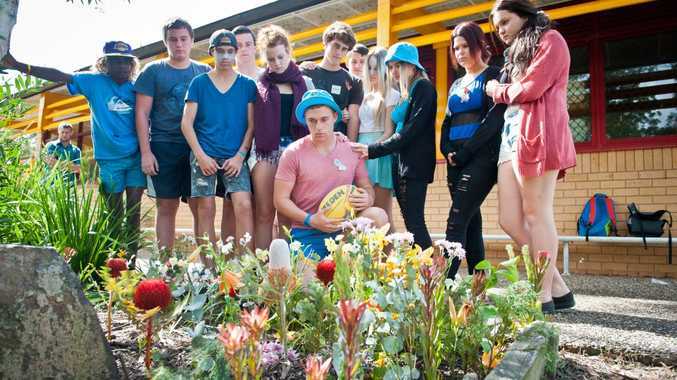 In a tribute to the gifted athlete who died from a serious head injury suffered during a weekend rugby league game, Toormina High students and teachers have shared their feelings and fond memories. On Monday as his parents made the harrowing decision to switch off the life support, a sign in the school yard read: "Our love and thoughts are with Jake Kedzlie and his family". Friends have since left a host of moving tributes on a Facebook page posted in his honour, while a paddle-out is being organised at Sawtell Beach next week. Jake's grandfather, league great Tommy Raudonikis spoke on behalf of his daughter Corryn, Jake's mother. "We just can't understand. He had the world ahead of him, and everybody loved him. It's unbelievable," Tommy said. "It's truly devastating. He was just a lovely young boy. "Corryn has done it tough. They've got another week before the funeral so it's going to be pretty hard on them." Jake, an aspiring five-eighth, had been offered a contract with the Wests Tigers, was a Group 2 best and fairest junior and star player in his Sawtell Panthers team and junior representative sides. The on-field head injury that claimed his life at Rex Hardaker Oval in Saturday's match against the Kempsey Dragons was described by Raudonikis as a "freak incident". Coach Alec Cullen said Jake's head collided with a player's knee as he went in to make a tackle. "There was nothing in it at all," Alec said. "I can't praise the other team enough for all their help when Jake went down. They acted like true champions. Jake was a brilliant footballer. He had the world at his feet, such a tragedy." "He was such a caring guy. If you were upset he was always the one to notice. "He would always say you're beautiful and strong.